Gioele W. Albisetti, Martina Pagani, Evgenia Platonova, Ladina Hösli, Helge C. Johannssen, et al. People readily distinguish between itchy and painful stimuli, but the neural basis for this distinction remains incompletely understood. Sensory neurons that respond to itch-inducing substances also respond to painful stimuli, leading to the hypotheses that pain and itch are differentiated by activating different combinations of afferents or through intensity coding. 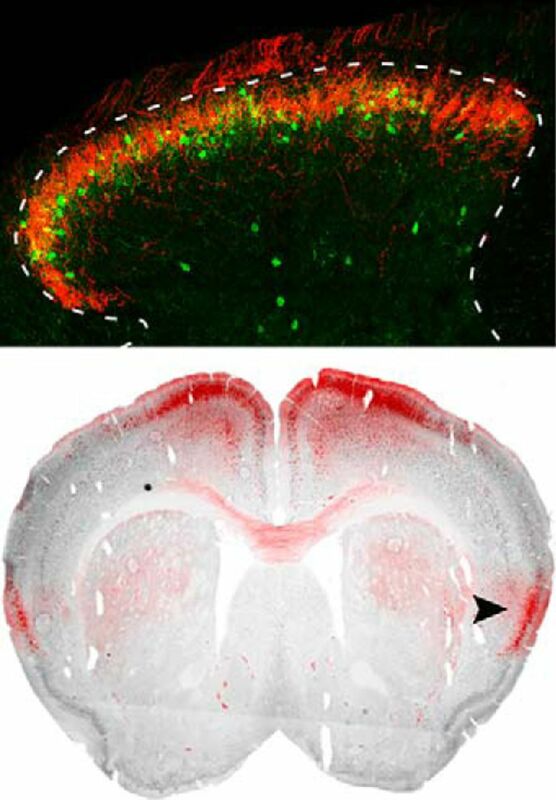 Afferent information is processed by excitatory and inhibitory interneurons in the spinal cord dorsal horn, and this processing is thought to result in selective transmission of itch or pain signals to the brain. GRP (top, green; bottom, red) is expressed in spinal dorsal horn (top) adjacent to itch-conveying afferents (red). It is also expressed in many itch- and pain-associated brain areas, including insular cortex (bottom, arrowhead). See Albisetti et al. for details. Spinal projection neurons that express receptors for gastrin-releasing peptide (GRP) are thought to be selective for itch transmission, because ablating these neurons reduces behavioral responses to itch (scratching and biting), but not pain (licking and wiping). Whether inputs to these neurons selectively convey itch information is controversial, however. Initial studies suggested that GRP is expressed in itch-specific afferents from the dorsal root ganglion (DRG), but a subsequent study disputed that finding. Specifically, Sun et al. (2017 Neuron 93:840) reported that GRP-expressing neurons are located in lamina II of the spinal dorsal horn (not DRG) and are involved in signaling pain as well as itch. Using the same strain of mice as Sun et al. (2017), Albisetti et al. confirmed that GRP neurons are present in dorsal horn lamina II and not in DRG. They also confirmed that these excitatory neurons receive input from afferents that express a receptor for itch-inducing chemicals. Activating the designer receptor hM3Dq, which was expressed selectively in GRP neurons and usually excites neurons, elicited dose-dependent increases in itch responses. But activating these neurons did not affect responses to thermal or mechanical stimuli. Moreover, selectively ablating GRP neurons reduced behavioral responses to several itch-inducing substances, but had no effect on responses to noxious stimuli. These results suggest that GRP-expressing neurons in the spinal dorsal horn are involved selectively in eliciting itch responses. Albisetti et al. suggest that the disruption of pain responses reported in previous work resulted from ablation of GRP neurons in the brain; they made deliberate efforts to avoid this confound. It remains possible that GRP neurons are activated by noxious stimuli, but this may lead to suppression of pain signals by activating inhibitory interneurons. Future work should test this possibility. Aaron Held, Paxton Major, Asli Sahin, Robert A. Reenan, Diane Lipscombe, et al. Amyotrophic lateral sclerosis (ALS) is characterized by degeneration of corticospinal and spinal motor neurons. One of the genes most commonly affected in ALS is SOD1, which encodes superoxide dismutase, a ubiquitously expressed antioxidant protein. How mutations in SOD1 cause ALS is unclear, but both loss of normal function and gain of toxic function have been proposed to contribute to disease progression. To elucidate the pathological effects of SOD1 mutations, Held et al. examined Drosophila in which an ALS-linked mutation was knocked in to the native SOD1 gene. Previous work showed that crawling was slower than normal in these dSod1G85R larvae and the animals ultimately died because the adult flies failed to emerge from the pupal case. Held et al. attributed the failure of pupal emergence to insufficient contraction of abdominal muscles resulting from disruption of motor axon structure and reduced numbers of neuromuscular junctions. Motor function was also impaired in larvae, as evidenced by reduced frequency of motor axon bursts during fictive crawling. Surprisingly, however, few defects in motor axons or neuromuscular junctions were apparent at the larval stage. Excitatory inputs to motor neurons from central pattern generating interneurons also appeared normal in mutants. Notably, however, when segmental nerves were severed to disrupt sensory feedback from the muscle wall to the ventral nerve cord, motor-axon burst frequency increased in dSod1G85R larvae; importantly, deafferentation had no effect on motor output in control larvae. Finally, motor defects in dSod1G85R larvae were rescued by overexpressing Gbb, a BMP-family neurotrophic factor, in glutamatergic neurons (including motor and some premotor neurons), as well as by overexpressing a constitutively BMP receptor either in glutamatergic neurons or in a subset of sensory neurons that included proprioceptors. These results suggest that the earliest motor deficits induced by an ALS-linked SOD1 mutation in Drosophila arises from defects not in motor neurons, but in other neurons, likely including proprioceptors that provide feedback to central motor circuits. This altered sensory feedback slows motor output. Whether this sensory defect is a prerequisite for later motor-axon degeneration remains unclear. Future work should test this, as well as investigating the therapeutic potential of modulating BMP signaling in ALS patients.